Evacuated tube solar collectors are fast becoming the preferred option for residential, business and commercial hot water heaters in Australia, due to their high efficiency, lightweight and low maintenance construction. SunSource Energy is your local installer of solar hot water systems in Brisbane, Sydney, Gold Coast, Ipswich and all major regional centres. For more information about Apricus solar hot water systems please click below. Our solar collectors and frames are manufactured in our own manufacturing facility. The facility is managed by fellow Australian and Apricus global CEO – Mick Humphreys, who oversees all operations. The facility is regularly audited by European, Australian and local authorities to ensure adherence with product standards, labour laws, safety regulations and environmental requirements. We have obtained Australian Standards (AS2712:2002), SRCC (USA) and Solarkeymark (EU) certifications. Our factory is also certified to ISO9001:2008 management and production standards. We regularly provide systems for solar hot water in Brisbane, Sydney, Gold Coast and other regional centres in NSW and QLD. 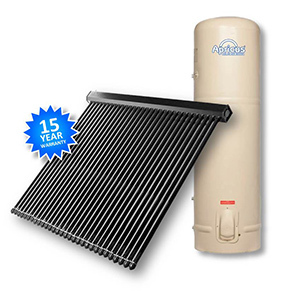 Because we own and manage the manufacturing process, we are able to proudly offer an industry leading 15 year warranty on Apricus evacuated tube solar hot water collectors installed in both Domestic and Commercial installations. That’s a 15 year warranty on the mounting frame, 15 year warranty on the evacuated tubes and heat pipes and 15 year warranty on the manifold – now that is peace of mind!